If I'm not mistaken, I bought this book LAST YEAR. But because I was a freshman and still am, I couldn't find time to read this book at all. So, when the holiday came around last month, I finally got time to read it! YAY! I was happy beyond words because as you might know, I loved the series so much and even rated and reviewed the last book very positively. So I was very hyped to read this sequel. But, wait! This book isn't a sequel to The Last Ever After, which was the last book in The School for Good and Evil trilogy. But this book is the first book in the completely new arc of The School for Good and Evil which takes place after the first trilogy. Sounds confusing, eh? But fear not. It doesn't matter. So, on to the review, shall we? 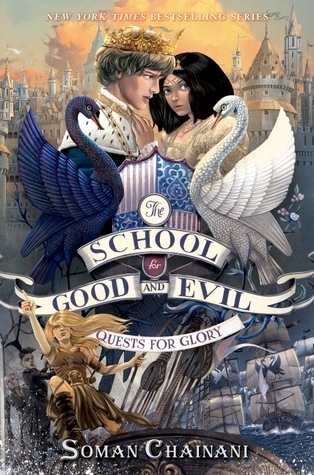 So, in this book, the conflicts are all about the quests that each character has to face on their 4th year of being a student in the School for Good and Evil. But, little do they know that all of their quests are connected to each other and that all of them are in imminent danger. I am not going to spoil anything because it would take away the fun of reading this gem. But you should know that there will be many heart-wrenching conflicts and obstacles in the way of our dear characters. Just as you think they have been saved from one problem, another problem comes in their way and attack them TEN TIMES WORSE than the previous problem. But it all makes sense because you will be warned firsthand about this. So yeah, brace yourself. First, Sophie is such a narcissistic sweetheart here. Okay, my opinion might be a bit biased because I love Sophie to bits even though I know she's like the embodiment of Mean Girls in one body--vain, annoying, selfish. At the beginning, she is still her usual self with all the drama, but then towards the end, she develops into this selfless girl who is really mindful of others and is actually really nice. Ha! Can you believe it? Sophie and nice in the same sentence? But it's true! Second, let me thank God for letting Tedros actually grows into a slightly more mature guy towards the end of the book. Yeah, I hate Tedros so much at the beginning because he is just SO STUPID! He never listens to anyone and he is all talk. It is frustrating seeing him rule his own kingdom, even Sophie could make a better ruler than him. But I really sympathize with him. I understand that he must have felt so pressured and burdened because everyone with no exception expects the best from him while in truth he is just a little boy. Now that I think about it, I think Tedros is the most realistic character of all because he makes SO MANY bad decisions and acts like an actual teenager who is supposed to be like a king but actually not ready for it. There are so many other characters, but I'm not going to say everything about them here because it will be spoiling too much. But let's just say that there will be a lot of characters playing important parts here! Such as Hort, the three witches (Anadil, Hester, and Dot), some Ever girls, and some new characters. I'm not just talking about Agatha x Tedros here, but also the friendship between Agatha and Sophie! I love Agatha and Tedros, but not nearly as much as I love Agatha and Sophie. I love how they complete each other in ways that romantic couples cannot. I love how Sophie becomes sweeter, nicer, and less selfish when she is with Agatha. It's like Agatha brings out the best in Sophie. And oh! There are also two ships coming your way! I'm not going to say anything about it, but I'll tell you that I love one of the ships so much that I literally bookmarked every part when they talk to each other. Yes, they are so many swoon-worthy moments here! I love how Soman Chainani plays with my heart, cuts it with a knife, and feeds it to a lion. I felt a trainwreck of emotions during this book. I was happy, devastated, elated, frightened, worried, melancholic, and other kinds of emotions I have never felt before. I read this book while standing on the train and I gasped so loud that many people stared at me but I didn't care. I was too engrossed in this book to pay attention to my surroundings. If you are looking for a light read, this book is not your cup of tea. Because it is so dark and cruel that you will dream about it for days or even weeks. In most cases, I loathe multi POVs in books. Especially in books that use first person POV. But in some rare cases, usually with third person POV, I love it. This book is one of those rare cases. At first, I was only expecting to read from Sophie and Agatha's POVs. But then more POVs come up along the way, such as Hort's, Tedros's, the coven (Anadil, Hester, Dot), and one smartass new character. I love it because it gives me some kind of mental break if the previous chapter has been full of angst, blood, sweat, and tears. It is also nice to know how other characters feel towards a situation after reading about that situation through the eyes of one character. If there is anything that I love the most about this book, it's the fact that this book was able to make me hold my breath, stay unblinking for minutes, drop my jaw, and scream like a maniac. I was glued to my seat the instant I sat and opened this book. I just couldn't stop because there was nothing else that mattered except knowing what would happen next to my dear characters and especially Sophie. I was gripping my seat and trying so hard not to squeal and yell when I was reading it in public places. I could even hear my heart beating in my chest because I was terrified. I even consciously tried to slow down my reading because I was reading as fast as the event occurred inside the pages. In all, this book lives up to my expectations and hype. I was expecting life-risking adventures, heartfelt relationships, character developments, and hilarious conversations, and boy did I get them all here. This book is everything I expected and more. You should totally read this book if you've read the previous ones and if you haven't, THEN GO READ THEM RIGHT NOW! !